Perhaps many people overlook minor vacation destinations like water reservoirs. 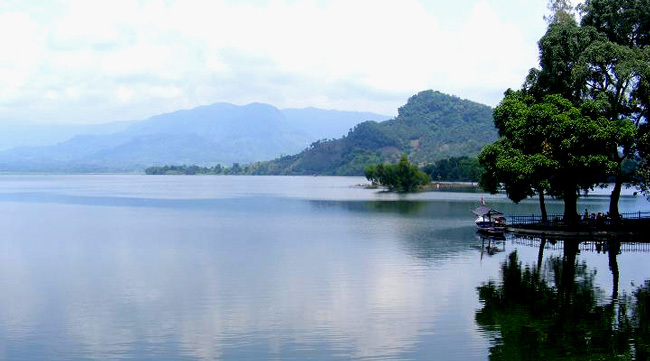 However, they may change their mind if they come to Malahayu Reservoir located in Brebes Regency. To be exact, the location is in Malahayu Village and it belongs to Banjarharjo Sub-District. Well, it is true the prime function is to supply water to nearby settlements but it also has become a new vacation destination for both locals and outsiders when in Indonesia. Visitors are likely to enjoy relaxation, photography, and sightseeing there. Another allure of the site is none other than its historical value. It is because the reservoir was built during a colonial era! In terms of nuance, the dame offers a peaceful atmosphere and clean environment. The size is approximately 944 hectares, which is considered vast! According to the locals, the reservoir was built in the 20th century during the reign of the Dutch in 1930. Once arriving at the site, tourists may see various landscapes including local farms, big trees, mountainous panorama, and some operating facilities. The good thing is that the location is near to Tanjung area, which connects to several regencies including Slawi, Brebes, and Cirebon. No wonder, lots of outsiders often come to the site either for dropping by or spending a vacation. Commonly, people are interested in visiting Malahayu Reservoir to learn the function and history. Well, they may hire a tour guide if necessary. It is said the reservoir was built by the Dutch during their reign in Indonesia. The good thing is that it still functions well until now, either to irrigate nearby local farms or to generate electricity. These days, in fact, the local government has included the site as one of vacation destinations in Brebes Regency despite lacking sophisticated facilities. Even the trip to reach Malahayu Reservoir is quite worthy. All the way to the destination, tourists may see various landscapes and scenery including local farms, tall trees, and a pine forest. Once arriving at the gate or the entrance, visitors should pay the fee. A guard works there, after all. Have no worries. The fee includes the parking service and common facilities like toilets. Thus, tourists who come with a private car can park their vehicle easily. For the best sightseeing and photography, tourists should get to the edge of the reservoir. That means they should climb the stairs of the dam first, which may take some stamina. Have no worries. The reward never disappoints them. Other recommended places to relax are under nearby trees and at available traditional eateries. Thus, do not forget to carry extra money to buy foods and drinks later. For those coming from Semarang City, they can simply head to Malahayu Reservoir immediately. The distance is 221 km, so the trip may take approximately 5 hours and 8 minutes. As for the best route, it is Raya Pantura Street. The first checkpoint is Banjarharjo Sub-District at Brebes Regency. Lastly, tourists should head to Malahayu Village where the reservoir is located.